Bells of Ireland is an unusual annual flower. 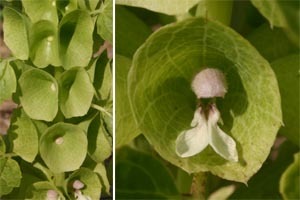 Bells of Ireland or shellflower, Molucella laevis, is a half-hardy annual that produces unusual pale green to emerald green, funnel-shaped “bells” along green stems in summer. The persistent bells are the showy calyx (cup-shaped leaves around the base of the flowers) which surrounds tiny fragrant white flowers. 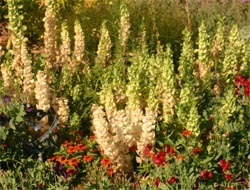 The papery ¾ -1¼” bells are densely packed along most of the length of the square stems that reach 2-3 feet tall. Clusters of 2½” long leaves alternate between the bells, with pairs of small thorns or spines below each calyx. Tiny white flowers are surrounded by a papery bell. Despite the common name, this plant in the mint family (Lamiaceae) is not from Ireland, but is native to western Asia, around Turkey, Syria and the Caucasus. Even Linnaeus, who named the plant, was a bit confused about its origin, naming the genus after the Molucca Islands in Indonesia where it was mistakenly thought to be from. It’s supposed association with Ireland probably has to do with the color (and associated marketing potential). It has been cultivated since 1570; the flowers are a symbol of good luck. Both the flowers and rounded, pale green leaves with slightly scalloped edges have a distinctive, difficult-to-describe scent. Old flower spikes turn brown and dry. Bells of Ireland are nice when combined with other colorful annual flowers in the border or cutting bed. They also do well in containers, offering a vertical component. The light green color complements purple-leaved plants, or can be used in monochromatic schemes with other green-flowered plants such as Zinnia ‘Envy Double’ and Nicotiana langsdorffii, or along with bright green coleus (such as ‘Super Chartreuse’). They even look interesting late in the season when the old spikes become dry and bleached (if they haven’t been pruned out to encourage new growth). Blooming stems can be cut to be used fresh or dried in flower arrangements. They are especially effective when used in all-foliage and contemporary arrangements. When dried, eventually the color fades to a pale beige. To dry, pick the stems when the bells are fully open and hang upside down in small bunches in a dry, airy place until fully dry. 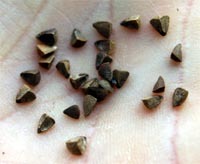 The small, dark-colored seeds are triangular in shape. This bedding plant is easily started from seed. 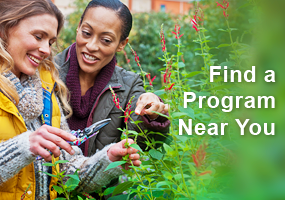 Sow seeds indoors 8-10 weeks before last frost. Barely cover the seed as they need light to germinate. Germination may be slow (up to a month). To speed up germination, chill the seeds for two weeks (seal the sown seeds in a plastic bag and place in a refrigerator) first. 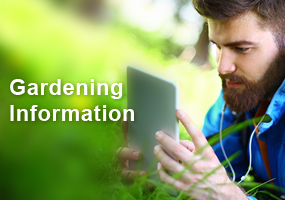 The small plants can be transplanted outdoors once nighttime temperatures are above 40F. 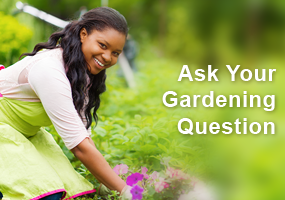 Place in sun to partial shade in ordinary garden soil and space about a foot apart. 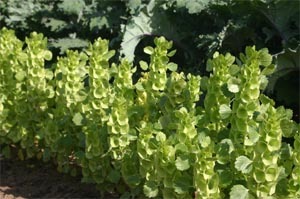 Bells of Ireland often self-seeds in the garden if flower stalks are left on the plants until dried. The dark colored seeds can be collected to save for sowing the following year or allowed to scatter on the ground. Small seedlings can be transplanted to other locations, if desired (although they may wilt temporarily until re-established). (L-R): Seedling, young plant and flowering plant of Bells or Ireland. Bells of Ireland prefers full sun and regular water. Water during drought periods and fertilize monthly for best results. They do not do well in summer in hot, humid climates. Taller spikes may need staking in windy sites. Bells of Ireland has few pest problems and is not favored by deer or rabbits.